Coming This Spring and Selling Very Quickly! 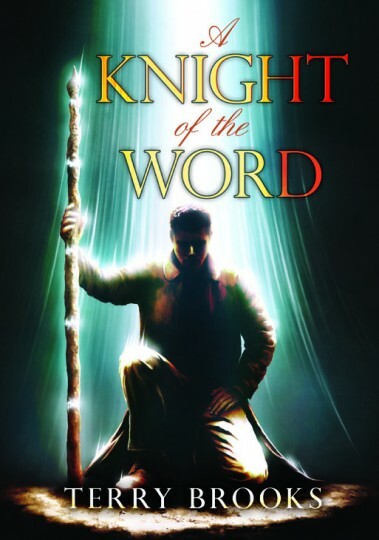 This is the discussion thread for the A Knight of the Word announcement! This is easily my favorite set of books from Terry Brooks. Mine too. Though the follow up is pretty good too. As far as the Shannara books go, I've only read the original trilogy and the 4 book set after that (Heritage??). Which are the ones right after Word/Void and can you read them w/o reading all of the earlier Shannara books without being lost? Nice one! I may or may not buy this but it's a great book. It's the Genesis of Shannara Series. Which as far as I'm concerned Terry Brooks has written the books in a way that There's 2 ways to read them. Publication order or Chronological (as in the time line of the world). So I think as long as you've ready the Word / Void trilogy you can read this one. As far as the Shannara books go, I've only read the original trilogy and the 4 book set after that (Heritage??). Those are the Shannara books I read too. If my memory is right after Heritage no more Shannara books came out for a while. When I saw new Shannara titles had been released I'd moved on, reading different things, and didn't really have the time necessary to revisit the Shannara landscape. There wasn't too much of a gap. I think 3 years between the last Heritage book and the prequel First King of Shannara. Then he switched to the other prequels and wrote the Word and Void Trilogy. I think in that gap in the mid 90's he wrote a couple more of the Landover books. To be fair "chronologically" you're not really missing a whole lot with the stuff that falls after Heritage. Voyage of The Jerle Shannara is pretty good, but everything after that kinda feels like it's rehashing the same ground. I mean how many times can you destroy and restart the druid order. Though in my opinion all the books that take place before "Sword of Shannara" in the timeline are worth a read. That'd be the Word / Void Trilogy, Genesis of Shannara trilogy, the two Legends of Shannara books, and the direct prequel to Sword of Shannara The First King of Shannara. Dan I think it was this thread that reminded me so I guess I owe you a Thank you. I was reminded of a fantasy author I read whose series is still continuing. He had new releases (I didn't know about) in 2008 and 2015 and a second collection of tales for his fantasy world series. Now there are five paperbacks by this author I want. I just ordered one, a unique graphic novel paperback-A small traditional looking paperback, not a big graphic novel like we see today. Due to some snarky comments (not here at this super nice forum) about the author's first trilogy I am not mentioning his name. Last edited by c marvel; 01-21-2019 at 04:57 PM. Dan I think it was this thread that reminded me so I guess I owe you a Thank you. I was reminded of a fantasy author I read whose series is still continuing. He had new releases (I didn't know about) in 2008 and 2015 and a second collection of tales for his fantasy world series. Now there are five paperbacks by this author I want. I just ordered one, a unique graphic novel paperback-A small traditional looking paperback, not a big graphic novel like we see today. Due to some snarky comments about the author's first trilogy I am not mentioning his name here. You wanna send me that author's name? No fair!!! Now I want to know who this is.